The Mercedes-Benz Arena got built between 1929 and 1933, and opened on the 26th of July 1933 with the German Gymnastics Championships. The stadium was initially called Adolf-Hitler-Kampfbahn, and could hold about 35,000 spectators. Just two years later, the stadium got already further expanded with wooden stands to a capacity of over 70,000 places, though these stands had to get closed in 1938 due to safety regulations. 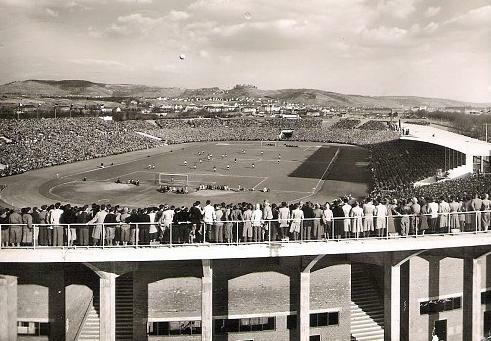 After the Second World War, the name of the stadium was first changed to Century Stadium, and later in 1949 to Neckarstadion. Right after, Neckarstadion got properly expanded and reached a capacity of almost 100,000 places. In 1959 the stadium hosted the European Cup final between Real Madrid and Stade de Reims (2-0). A few years later, in 1962, Atlético Madrid beat Fiorentina 3-0 in the replay of that year’s Cup Winner’s Cup final. In the early 1970s Neckarstadion got extensively renovated to prepare it for the 1974 World Cup. Works included the reconstruction of the main stand and cover for the opposite side. Capacity was reduced to 70,500 places. 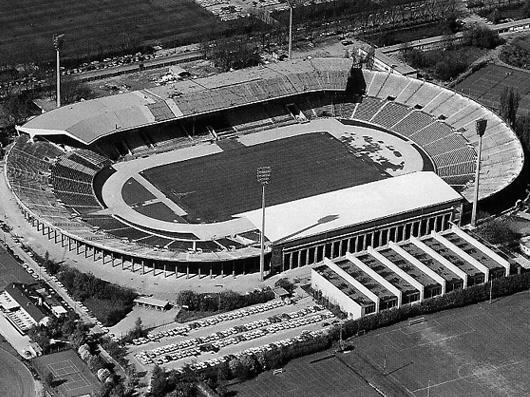 During the 1974 World Cup, the stadium hosted three matches in the first group stage, and the match between Poland and Sweden (1-0) in the second group phase. 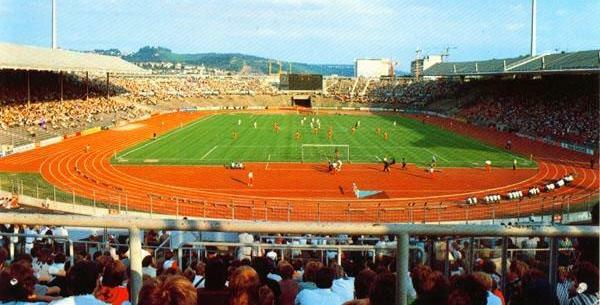 In 1988 Neckarstadion hosted its second European Cup final. The match between PSV Eindhoven en Benfica was won by the Dutch on penalties after having drawn 0-0 in regular time. One month later, the stadium was one of the playing venues of the 1988 European Championships, hosting one first round group match and the semi-final between the Soviet Union and Italy (2-0). Further redevelopments in 1993 saw the majority of the terraces converted into seats, and a roof constructed that covered the complete stadium. At the same time, the stadium changed name to Gottlieb-Daimler-Stadion, prompted by the financing of the works by car manufacturer Daimler-Benz. Gottlieb-Daimler-Stadium underwent a next renovation in preparation for the 2006 World Cup, which included the reconstruction of the upper tiers. During the World Cup, the stadium hosted 6 matches, including four first round group matches, the round of 16 match between England and Ecuador (1-0), and the match for third place between Germany and Portugal (3-1). 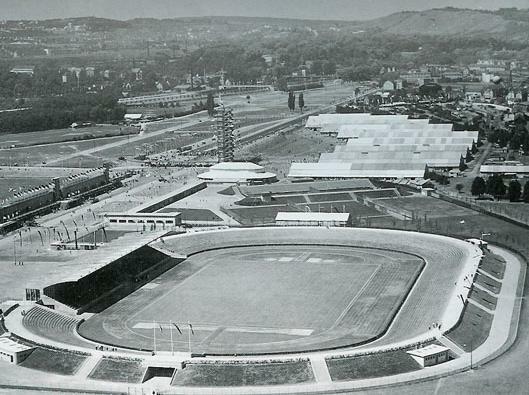 At that time, the stadium still had an athletics track, but in 2008 the city of Stuttgart decided to convert the stadium into a proper football stadium. The pitch was lowered, two new stands were built at the short ends, and the other stands extended closer to the pitch. Capacity increased to its current total, and at the same time the name of the stadium got changed to Mercedes-Benz Arena. Works were completed in the middle of 2011. The Mercedes-Benz Arena is located in the east of Stuttgart on the east bank of the river Neckar, about 4.5 kilometres from Stuttgart’s city centre and main rail station. If arriving by car, from the motorways around Stuttgart signs with a stadium symbol will guide you, via the B10 and B14, to the stadium. If using public transport, take overground metro (S-Bahn) line S1 from the main rail station (Hbf). Take the train in the direction of Kirchheim and get off at stop Neckarpark. From there it is a 5-minute walk to the stadium. On match days, Stadtbahn line U11 can also bring you from the main rail station to the stadium (NeckarPark). The Mercedes-Benz Arena is squeezed in between the river Neckar and some railroad tracks, and is surrounded by other sports and event facilities, some light industry, and a few warehouses. There is little in terms of eating and drinking around, which can better be done in Stuttgart’s city centre. If you wish to stay as close to the arena as possible, the Hilton Garden Inn NeckarPark will likely have your preference. It it is located right across the stadium, but does come in the higher price ranges. Hotel Discovery and Stadthotel am Wasen are two cheaper alternatives located right on the other side of the Neckar. Attimo Hotel Stuttgart and Hotel Geissler are also still at walking distance, located near Bad Canstatt rail station, and even though a little pricier, they are situated near the nice local old town with some eating and drinking options around. Click here for all hotels near the Mercedes-Benz Arena, and here to explore the options in Stuttgart’s city centre. Tickets for VFB Stuttgart games can be bought online, by phone +49 (0) 1806 99 1893, or in person at the Fan-Center at the Mercedes-Benz Arena, the VFB City-Shop at the Königstraße 23-25 in Stuttgart’s city centre, the VfB Fan-Shop at the Milaneo Shopping centre in the north of Stuttgart, or at the tourist information centre at Stuttgart airport. Stuttgart’s attendances have risen significantly since the 2011 renovations, but the club only sells out about a third of their home matches and tickets are generally easilty available in pre-sale. Tickets range in price from €22.00 for a seat at one of the curves to €55.50 for a central seat at the main stand. Standing costs €14.50. Prices are increased for high-profile matches to between €27.00 and €63.50. Standing costs €16.50. You can find a seating plan here. Email ticketservice@vfb-stuttgart.de for more information. 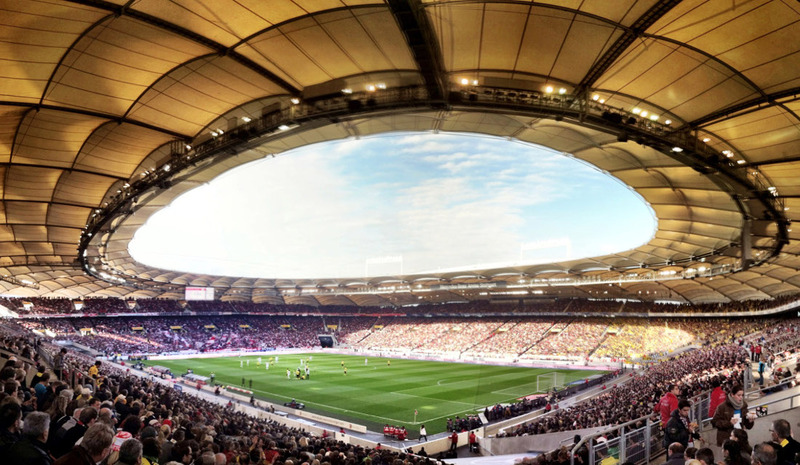 Stuttgart offer a range of guided stadium tours, of which the Fan-Tour is most common. This tour lasts 90 minutes and includes the dressing room, players tunnel, dugouts, VIP facilities, and press areas. Tours run multiple days a week, typically at 12:00 noon or 2:00 pm, with more tours on the weekends. Check the Mercedes-Benz Arena official website for the current schedule and bookings, which is required. The tour costs €8.00. Email arenatour@vfb-stuttgart.de for more information. VFB.de – Official website of VFB Stuttgart. VVS.de – Stuttgart public transport information. Did the stadium tour last year as we were in Stuttgart for Cannstatter Wasen. Some real gems to pick up on as well. Why is there a window in the gents toilet? and what feature of this stadium did the Allianz Arena adopt and now pay VfB for?